Since the online application option was introduced, more than 6 million people have applied online for Social Security retirement benefits. (NAPSI)—Americans nearing retirement age are living healthier, working longer and playing harder than any past generation. Let’s face it—this is not your parents’ retirement plan. In fact, even how to apply for retirement benefits has changed—and for the better. Instead of waiting in line to apply in a busy government office, more and more people are applying for retirement benefits from the comfort of their home using Social Security’s website, www.socialsecurity.gov. About half of all retirement applications received by Social Security each month are online. Already, millions of people have taken advantage of this easy, secure and convenient way of applying. Applying online is convenient and will save you time and stress. The application is easy to use and can take as little as 15 minutes to complete. You can save your work at any point in the process and finish at a later time without having to start over. • A confirmation number to check the application status at any time. Before applying, anyone thinking about retiring should make an informed decision based on a number of factors, such as current cash needs, health and family longevity, whether to work in retirement and future financial obligations. It’s important to know that you can begin Social Security benefits as early as age 62, but the amount is reduced if received before “full retirement age.” Right now, the full retirement age is 66, but it will reach age 67 for those born in 1960 or later. 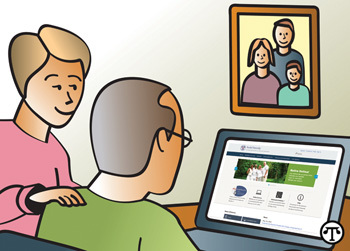 Social Security offers online tools to help you understand your retirement options. The Retirement Estimator (www.socialsecurity.gov/estimator), for example, gives estimates based on your actual Social Security earnings record and allows you to customize your estimate by changing your “stop-work” age and future earnings. Another tool to help you plan for retirement is a my Social Security account. If you are not yet receiving benefits, you can create an online my Social Security account to access your Social Security Statement. The Statement includes your lifetime earnings record, as well as estimates of potential retirement, disability and survivors’ benefits. You can register for a my Social Security account at www.socialsecurity.gov/myaccount. It’s never too early to start retirement planning. If you are ready to hang up your briefcase or tool set, the journey is now a lot easier. Join the millions of Americans who are applying for retirement benefits the fast, convenient, secure and stress-free way: online. To learn more, go to www.socialsecurity.gov.